Attention of all the Zonal Railways/Production Units is invited towards Board’s instruction issued vide letter No.2016/F(E)III(1)/7 dated 22.05.2017, vide which the Department of Pension Pensioners’ Welfare(DOP&PW)’s 0.M. No.38/37/2016-P&PW(A) dated 12.05.2017 was circulated for information and compliance. In terms of this O.M., the revised pension/family pension w.e.f. 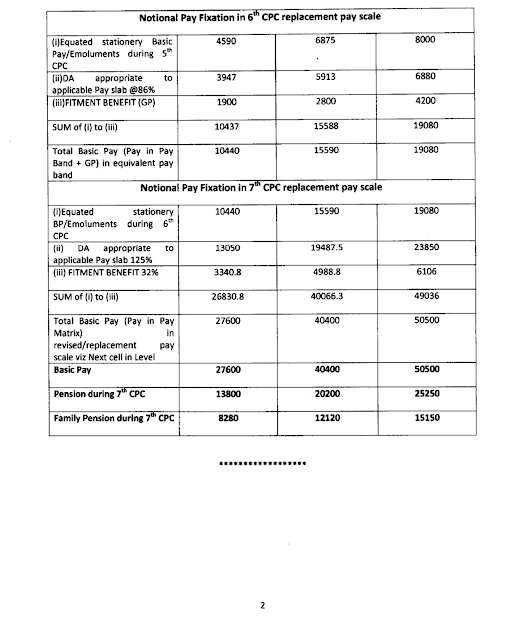 01.01.2016 in respect of all Central civil pensioners/family pensioners who retired/died prior to 01.01.2016 may be revised by notionally fixing their pay in the pay matrix recommended by the 7th CPC in the level corresponding to the pay in the pay scale/pay band and grade pay at which they retired/died. This will be done by notional pay fixation under each intervening Pay Commission based on the Formula for revision of pay. While fixing pay on notional basis, the pay fixation formulae approved by the Government and other relevant instructions on the subject in force at the relevant time shall be strictly followed. 50% of the notional pay fixed as above shall be the revised pension as on 01.01.2016 and 30% of this notional pay shall be the revised family pension w.e.f. 01.01.2016 as per the first Formulation. 2. The Department of Pension & Pensioners’ Welfare(DOP&PW) vide their O.M.No.38/37/2016-P&PW(A) dated 06.07.2017 (circulated on Railways vide letter No.2016/F(E)III/1(1)/7 dated 11.07.2017) have provided concordance tables for fixation of notional pay and pension/family pension of employees who retired/died in various grades during 4th , 5th and 6th Pay Commission periods. DOP&PW have clarified in para 4 of the OM. ibid that the concordance tables have been prepared to facilitate revision of pension of pre-2016 pensioners/family pensioners by the concerned pension sanctioning authorities. 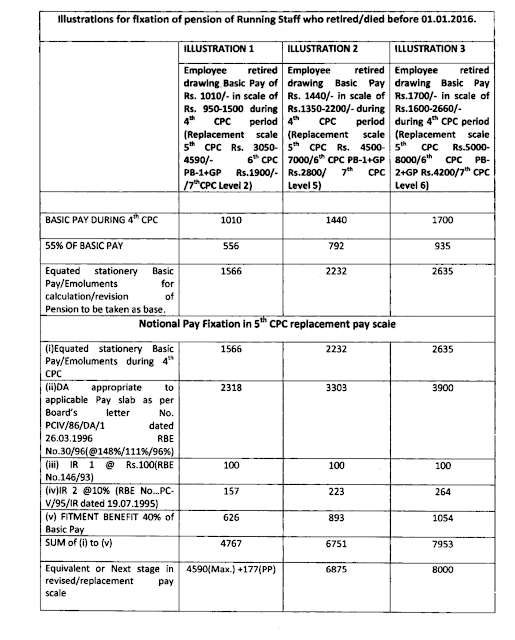 Although due care has been taken by DOP&PW in preparing concordance tables based on the fitment tables for fixation of pay from 4th to 5th, 5th to 6 th and 6th to 7th Pay Commission, still in the case of any inconsistency in concordance tables vis-a-vis the relevant rules/instructions, the notional pay and pension/ family pension of pre-2016 pensioners/family pensioners may be fixed in accordance with the rules/instructions, applicable for fixation of pay in the intervening Pay Commission periods. 3. After issue of Board’s letter No.2016/F(E)III/1(1)/7 dated 11.07.2017, references have been received from pensioners’ associations requesting to issue separate concordance tables, for running staff who retired/died during 4th , 5th and 6 th Pay Commission, duly taking into account pay element at the rate of 55% of basic pay for the purpose of fixation of notional pay and pension/family pension w.e.f. 01.01.2016. The issue has also been raised by staff Federations. 4. The above issue has been examined in consultation with Pay Commission Directorate of Board. The pay of the Running Staff is deemed to be ‘depressed’ vis-a-vis the Non- running Staff and the measure of depression is called the pay element. As per extant instructions, 30% pay element is reckoned for in service benefits and 55% pay element is reckoned for retirement benefits. However, once the deemed depression has been made good by adding the pay element to the basic pay of the running staff (e.g. on posting to stationary posts, medical decategorisation, retirement, etc. ), benefits specifically admissible to the running staff (on account of depression in pay) are not admissible to them. To illustrate this it would be worthwhile to note that a running staff is entitled to Dearness Allowance on the pay plus 30% pay element. However, a retired running staff gets Dearness Relief only on the pension drawn (pension which has been fixed taking into account 55% pay element) and for this purpose pay element is NOT reckoned, once again. Therefore, the emoluments (basic pay plus 55% thereof) at the time of retirement would be taken as reference basic pay for further notional fixation of pay in the subsequent CPC periods as per other (non-running) staff. 5. 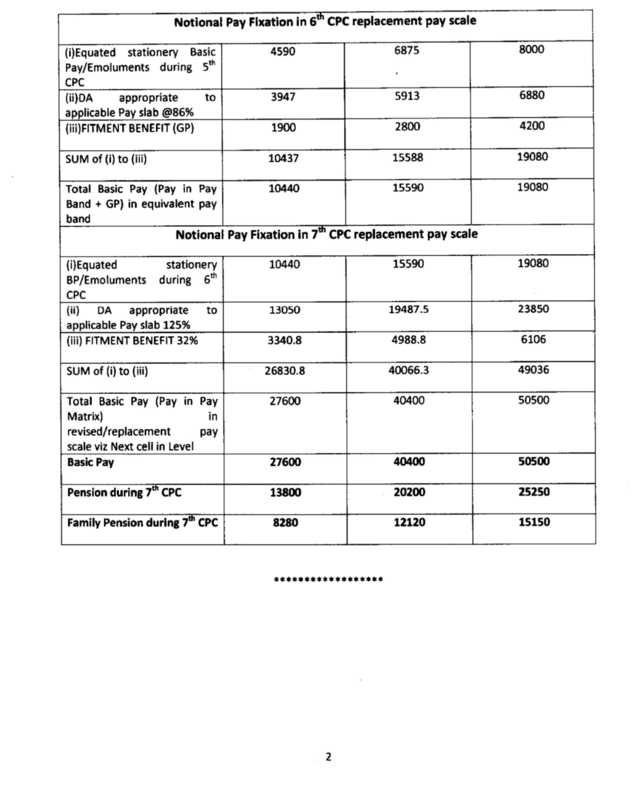 In this connection, illustrations in three cases as furnished by PC Directorate is attached as Annexure to facilitate notional fixation of pay in 4th , 5 th ,6th and 7th Pay Commission in respect of running staff who retired/died before 01.01.2016 for information and guidance. 50% of the notional pay fixed in such a manner shall be the revised pension as on 01.01.2016 and 30% of this notional pay shall be the revised family pension w.e.f. 01.01.2016 as per the first Formulation. Other conditions stipulated in DOP&PWs OM. dated 12.05.2017 & 06.07.2017 will apply in the case of running staff also. 6. The higher of the two formulations i.e. the pension/family pension already revised in accordance with Board’s letter No.2016/F(E)III/1(1)/7 dated 10.08.2016 or the revised pension/family pension as worked out in accordance with para 5 above, shall be granted to pre-2016 retired running staff pensioners as revised pension/family pension w.e.f. 01.01.2016. 7. It is also stated that corresponding pay scales/grade pay for notional pay fixation has to be strictly followed as per DOP&PWs OM. dated 06.07.2017 and not the replacement pay scales/grade pay which may have been allotted to the serving employees during a CPC period, due to specific upgradation of the post. Any clarification regarding notional pay fixation of running staff may be obtained from Pay Commission Directorate of Board’s office.